Windows Mobile Device Center with Windows Vista and Windows 7 only fully works with Windows Mobile 2003 and newer devices. 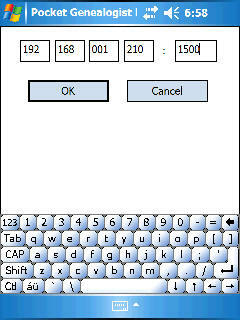 Pocket PC 2002 has limited support, for example you can install software, but you cannot synchronize Outlook data. When you attempt to synchronize Pocket Genealogist databases you will get an "Unable to Communicate" message. However, there is a workaround. 1. In Pocket Genealogist (on the desktop) go to "Options", "Advanced" and select "Use TCP/IP for Communications", "Let Device determine Address for Synchronization" and "Manual Synchronization". (The port can stay at the default value of 1500 but you can change it if you wish) Press "OK" to save the changes. 3. Go to your device and start Pocket Genealogist. (Dismiss the "Database" dialog if it displays) Then select "Tools", "Manual Sync" from the menu. 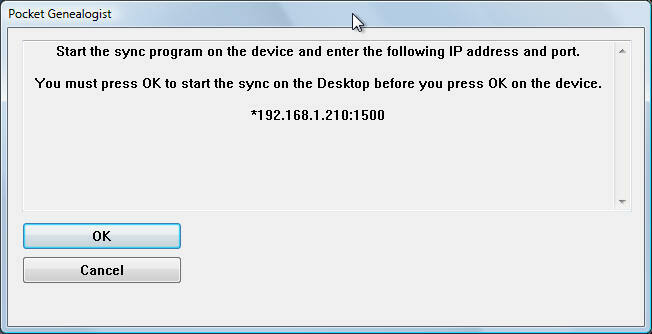 You should now see the following dialog... enter the IP address and port as displayed on the desktop dialog. Do NOT press "OK". Note: Subsequent syncs will have the information filled in from the last sync. 4. Now go back to the desktop dialog and press "OK"... the dialog will disappear. Then go to the desktop dialog and press "OK". At this point the synchronization screen on both the desktop and device should appear and you can proceed as normal.